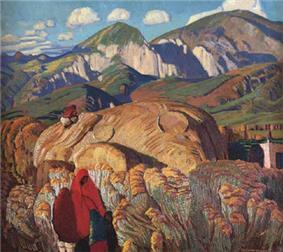 Haystack, Taos Valley, before 1927. Ernest Leonard Blumenschein (26 May 1874 – 6 June 1960) was an American artist and founding member of the Taos Society of Artists. He is noted for paintings of Native Americans, New Mexico and the American Southwest. While in Cincinnati, he also attended an illustration course from Fernand Lungren at the Cincinnati Art Academy, causing him to change his studies from music to art. He moved to New York City in 1892, studying at the Art Students League of New York. Attracted by the idea of studying art in Europe, he enrolled at the Académie Julian in Paris in 1894. There he met and became friends with Bert Phillips and the older and more experienced artist Joseph Henry Sharp, who told the two younger artists about his 1893 visit to Taos, New Mexico. 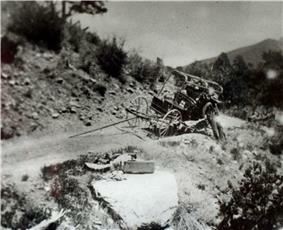 The accident that started the Taos art colony, 1898. In northern New Mexico, the rough road caused a wagon wheel to break. Blumenschein brought the wheel to be repaired in nearby Taos, leaving Phillips alone with the wagon. When Blumenschein returned three days later with the repaired wheel, they continued to Taos, where they sold their horse and equipage, set up a studio and began to paint. Blumenschein stayed in Taos for three months, returning to New York to resume his career as an illustrator of popular magazines and books (including two short stories by Jack London), while Phillips remained in Taos. Blumenschein returned twice to Paris to pursue further studies at Académie Julian: once in 1899 and again from 1902 to 1909. During the latter stay, he met and married artist Mary Sheppard Greene. 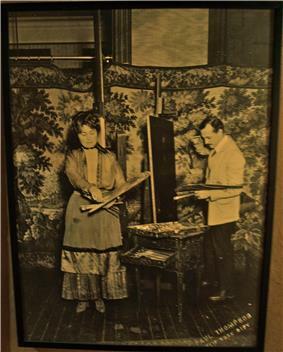 The couple returned to New York in 1909, where they worked as an illustration team. Blumenschein also took a teaching position at his alma mater, the Art Students League of New York. In 1910, Blumenschein was elected into the National Academy of Design as an Associate member, and became a full member in 1927. Ernest and Mary Blumenschein, New York, 1910. Paintings by Blumenschein are held in the Indianapolis, Indiana, the Harwood Art Museum in Taos, the Taos Art Museum and Fechin House, the New Mexico Museum of Art in Santa Fe, New Mexico and the El Paso Art Museum in El Paso, Texas. ^ "Taos Historic Museums". Taos Historic Museums. Retrieved 2014-08-12. ^ "National Academicians | National Academy | National Academy Museum". National Academy. Retrieved 2014-08-12. ^ "Taos Society of Artists :: The Harwood Museum of Art :: Taos :: University of New Mexico". Harwoodmuseum.org. Retrieved 2014-08-12. ^ "Searchable Art Museum". New Mexico Museum of Art. Retrieved 9 July 2013. Hassrick, Peter H.; Cunningham, Elizabeth J. In Contemporary Rhythm: The Art of Ernest L. Blumenschein. University of Oklahoma Press, 2008. ISBN 978-0-8061-3948-7. Larson, Robert W.; Larson, Carole B. Ernest L. Blumenschein: The Life of an American Artist. University of Oklahoma Press, 2013. ISBN 978-0806143347.